From its beginnings on individual unregulated farms to its growth through local and regional networks and to the establishment of a national standard, organic food has traveled an amazing path over the last fifty years. The growth has been continuous, driven both by increasing ecological concerns and heightened consumer demand. Domestic sales of organic foods have increased every year since 1990, with the accessibility of organic products rapidly expanding in all sectors of the market. The U. S. organic food market was worth $1 billion in 1990, $43.7 billion in 2017 and is expected to reach $70.4 billion by 2025. As this growth occurred, large conventional food companies like General Mills, Heinz, Smucker, Coca Cola, ConAgra, Kellogg, White Wave and Hain have bought up most of the original smaller stand-alone organic companies. The USDA organic label is being transformed. It is coming to represent an agriculture separated from the soil (if such a thing can be called agriculture). Tomatoes, peppers, lettuce, and berries grown without the plants ever touching the soil are being certified “organic” and are now dominating the market. Chickens and cows who have spent their lives on concrete now produce certified “organic” milk and eggs. I do not exaggerate. Under the National Organic Program, these practices are being regularly certified as organic on a massive scale. These are not small fringe players that don’t affect the fabric of the garment. According to research compiled by the Nielsen Co, “organic” hydroponic tomatoes, cucumbers and peppers represent over 30% of US sales in each category. I would suggest that in fresh tomatoes the number is actually much higher. In berries the percentage is uncertain, but based on information presented to the USDA Hydroponic Task Force, we know for sure there are over 1000 acres of “organic” hydroponic berry production. 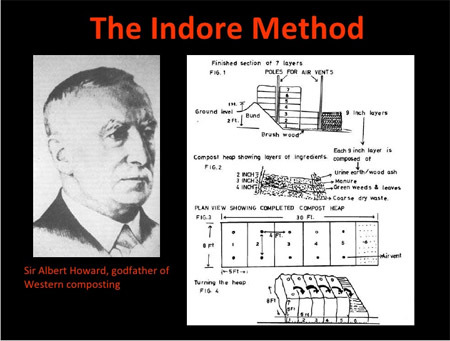 Many people active in organic agriculture today are unaware of the important role played by Sir Albert Howard and others of his generation, including F.H. King, Walter Northbourne, Lady Balfour, J.I. Rodale, and Louis Bromfield, in the development and diffusion of organic farming concepts. The recent rapid growth of the organic movement has resulted in a loss of connection with the historical figures and roots of organic agriculture. Scientists conducting organic farming research, farmers considering organic transition and the general public may benefit from knowing more of this history. Telling a history of organic farming – as with other great movements, such as alternative medicine – requires exploring the interplay between science, social values, economics, and the recalcitrance of established organizations to adopt new approaches. In tracing the historical trajectory from the genesis of Howard’s major organic concepts and practices (a living connection between soil fertility and plant and animal health, the Law of Return and composting) to the wide-spread adoption of these beliefs and practices, one encounters a series of battles between intellectual and economic stakeholders. 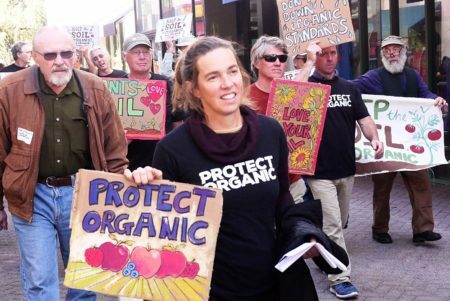 Although support for the organic movement has grown with public awareness, opposition to it has never gone away. These issues are reflected in the history of Howard’s contributions to organic farming. The story of this development of organic concepts in the 1930s to their fate as expressed in the current USDA National Organic Program occurred in a series of stages – the development of organic concepts and methods, polarization around them, then their recognition, accommodation, and finally their further extension. The original goal of the movement for organic farming was care for the soil and the watersheds, for healthy, nourishing foods, and for the many hands that tend the crops. Yet, as organic standards have developed, much of the emphasis has been on growing methods and too often, the farmers and workers who do the work have been left behind. A variety of voluntary ethical and labor justice certifications and programs have been created that can fill that gap. Although their standards, tools and theory of change vary, they share a common goal: safeguarding the people who grow the food. Any examination of ethical and labor justice certifications would be incomplete if it failed to address the massive imbalances of power that exist within the food system. As a reader of The Natural Farmer, we don’t need to tell you that our food system is broken. Here in the U.S., and around the globe, corporate-driven, industrial agriculture is polluting our planet and exploiting people. Farming has never been a lucrative vocation. Yet increasing corporate consolidation squeezes farmers as fewer and fewer companies control every aspect of our food system. According to the Farm Bureau, “farmers and ranchers in the U.S. receive only 15 cents out of every dollar spent on food. The rest goes for costs beyond the farm gate: wages and materials for production, processing, transportation, distribution, and marketing.” That’s less than half what it was in 1980. The path to regenerative organic agriculture started over seven decades ago. In 1942, J.I. Rodale wrote a few simple words on a black board: “HEALTHY SOIL=HEALTHY FOOD=HEALTHY PEOPLE.” In so doing, he set us on a path that links our personal health to the health of the soil, dictating that the way we farm does make a difference in human health and the health of the planet. In the later 20th century, as the organic community tried to create interstate and international trade in organic food and fiber materials, it became clear that a national standard was needed. 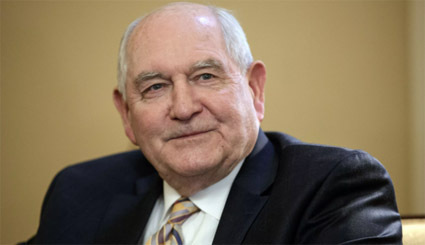 Such a standard could unify the many voices in the organic community; help grow the numbers of organic farms and products; and communicate to consumers through a forward-facing USDA logo representing the certification process and the standards themselves. 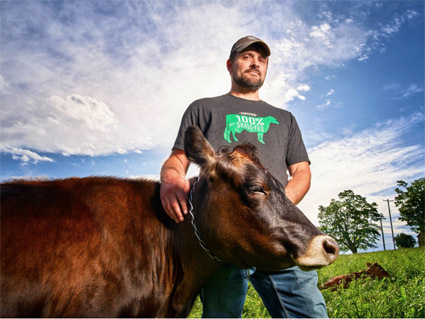 Tim Joseph, founder of first 100% grass-fed creamery in the east. Central New York, the rectangle comprised of Albany, Ithaca and the area perhaps 60 miles north and south of the line connecting them, is exceptional diary country. It is graced by emerald green, rolling country, small towns still with farming dealerships, moderate temperatures, 40 inches of rain and 180 days of sunshine per year. Not the world’s greatest soil for vegetables, it is excellent for grass. It was here, almost 10 years ago, that a creamery was started which was quickly to become a beacon for over 200 struggling local dairy farmers. The central idea was that an organic yogurt, made with 100% grass-fed milk, would appeal to a growing consumer segment. And with the premium from such a product a reasonable price could be paid to small farmers for their milk – a price high enough to keep them in business. The creamery was the brainchild of Tim Joseph, at the time a struggling diary farmer himself. But he didn’t start out that way. 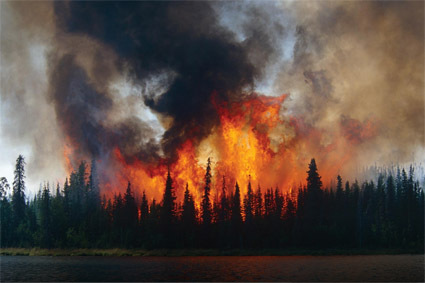 Colorado’s 416 Fire was called that because it was the 416th emergency incident in 2018 called to the attention of the San Juan National Forest’s Durango Interagency Dispatch Center. Last winter was one of the driest years in history for the U.S. Southwest. In June the ‘416 Fire’ started in the hills less than a mile from our farm. For six weeks we lived and worked in smoke as more than 55,000 acres burned, one of the largest fires in Colorado history. It cost taxpayers more than $27 million to contain and much more to our local economy. The prevalence of extreme precipitation events has risen substantially in the last 40 years. California is in the midst of a decade-long drought. These climatic extremes are thought to be a result of warmer poles, reducing the strength of the jet streams. 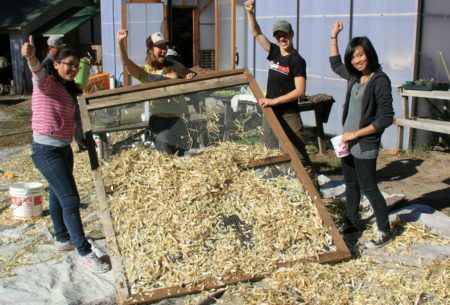 Food Justice Certification is still in the early adopter stage. The entities that certify are highly ethical farmers and food businesses that want to bring the public’s attention to the possibility that farmers could be paid fair prices and farmers can provide safe, respectful jobs with living wages to farm workers. Green-Star, an outstanding food co-op in Ithaca, NY, engages in FJC both to demonstrate that it has good labor policies and also that it is paying fair prices to the local farms that supply the store. Brandon Kane, General Manager of GreenStar, says that FJC expresses the values of co-op members. In a letter to other NE co-ops, Kane wrote: “Food Justice Certification through the Agricultural Justice Project has become a critical component of GreenStar Co-op telling its values story and backing it up with hard facts.” AJP and NOFA are partnering on a project that will assist organic farms in improving the labor policies and engage food co-ops in the region in more joint promotion with farms on shared values. Despite national consumer surveys by Consumer Reports showing that significant percentages of those surveyed highly value food grown with good labor policies (86% in 2014, 89% in 2016), there are few markets that offer premiums for food grown by happy workers. International fair trade has been able to convey the message that small farms in developing countries deserve a fair price to survive, though most programs do not include improving conditions for workers on these farms. The message that US farmers need fair pricing surfaces only during periods of more severe crisis, like the late 70’s and again recently, for dairy farms. 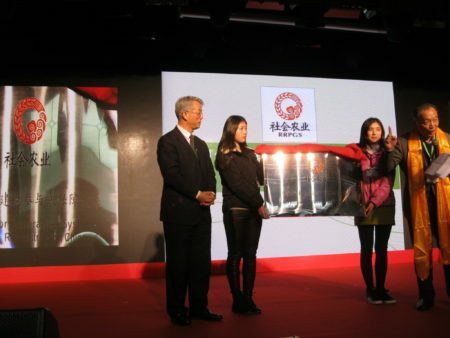 Presentation of the Chinese PGS at the Urgenci conference in 2015. Whether or not the third party organic certification system presided over by the National Organic Program loses integrity utterly, our movement for organic food and farming needs a Plan B. At the NOFA Summer Conference in my contribution to the discussion of the future of organic (https://foodfirst.org/publication/organic-food-where-do-we-go-from-here/), I suggested that we look to Participatory Guarantee Systems (PGS) for inspiration. This article is a quick introduction to PGS with resources for those who would like to learn more. Sidehill Farm: a Real Organic One! 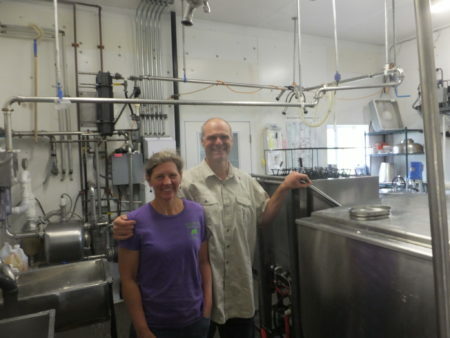 Amy and Paul pose by the bulk tank where all the milk is collected and chilled before processing. Amy is very happy with the labor-saving bottle washer (to the right of Paul) that handles 20 bottles at a time in a 5 minute cycle. The hill towns of western Massachusetts separate the Pioneer Valley on their east from the Berkshire Mountains on their west. Having neither the agricultural soils and climate of the valley, nor the majestic scenic appeal of the mountains, the hill towns are sparsely populated throughout the year. With an elevation of 1750 feet, compared to some of the Berkshire towns at over 2000 feet, and a density of less than 11 people per square mile, ranking it 348th out of the 351 cities and towns in the Commonwealth, Hawley is a typical hill town. While on an afternoon hike last fall, I sat down at the base of a large tree to take in what might be going unnoticed. Within seconds, a chipmunk appeared from behind a pile of large rocks. Based on its behavior, I suspected this chipmunk had had the good fortune of a past encounter with a hiker willing to share a snack. When it realized that I had nothing to offer, the chipmunk turned and began searching the area. It quickly stopped and began digging. Lucky guy, I thought, assuming that the chipmunk had located a cached acorn buried by a hard-working gray squirrel. It came as a surprise, then, when in less than a minute, the chipmunk unearthed an acorn sized truffle! Most of us have heard of truffles, though we often associate them with fancy European restaurants; black and white truffles, in particular, are prized ingredients. 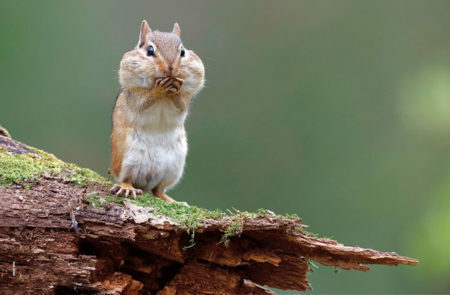 But truffles exist here, as well, and while our Northeastern chipmunks probably don’t have gourmet tastes, they’re certainly gourmand in their taste for truffles.